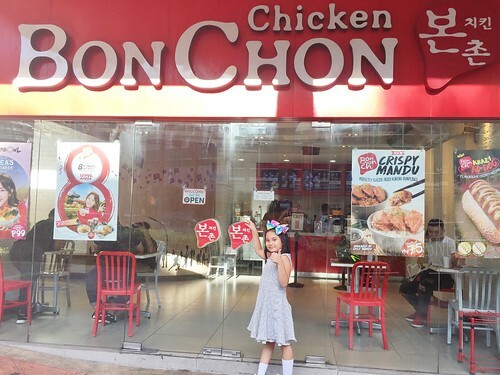 Kids Eat for Free at Bonchon! 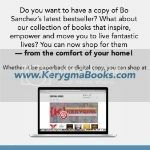 Every week, a mother’s dilemma is the family budget, and with the on-going inflation, it’s really hard to keep up especially when you want to treat the family to dine out. 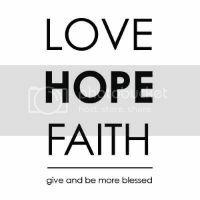 I have to admit, I am a sucker for free stuff – who isn’t right? 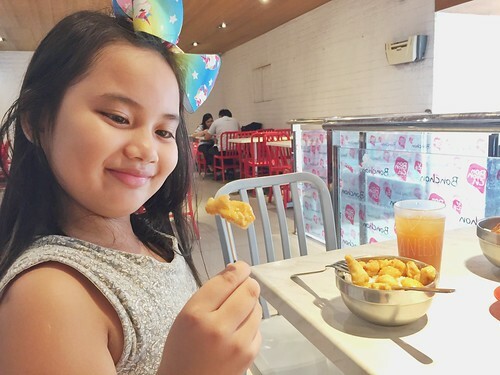 So, when I heard that Bonchon has an ongoing promotion where kids could eat for free – well my daughter and I made sure to visit and try it out. 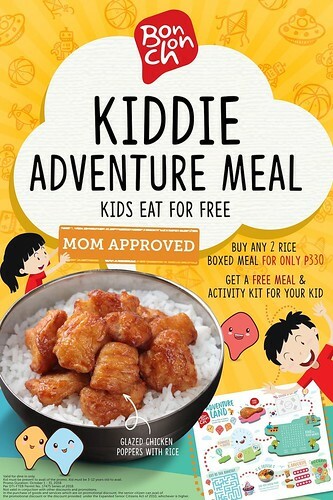 Bonchon is offering a Kiddie Adventure meal. For every purchase of any two (2) boxed meals at an SRP of Php 344, your kid gets an Activity kit and a free meal! We are not talking about a small or downsized meal here – I was absolutely surprised with the serving! Just tell the cashier that you would like to purchase the Kiddie Adventure Meal and you will be asked to choose 2 regular boxed meals of your choice – I was glad that Joy (the cashier) made it easy for me to choose by guiding me with the flavors and their best seller Soy Garlic 2PC Chicken Boxed Meal, then Joy suggested the Crispy ManduBoxed Meal, which is Korean-Stylechicken dumplings with rice. The Kiddie Adventure Meal comes a free Chicken Poppers with rice. 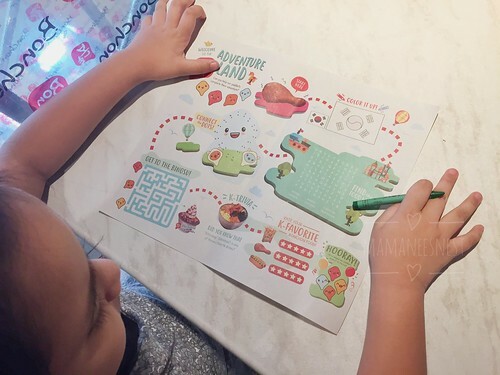 As we waited for our meal, my little lass, although hungry at the time, got busy with the Activity Kit and was excited to go through it – that she didn’t even realize that we were waiting for our food. After a few minutes, our meals were served, and I was overwhelmed with the hearty servings of each meal. It was more than enough for my little hungry lass! At first, she’s a little hesitant since she isn’t too familiar with the dish, but after one bite she was sold! I loved the Chicken Poppers since it was crunchy outside and meaty inside with the signature sweet Korean-style taste that Bonchon is popular for. We both walked out happy and satisfied. 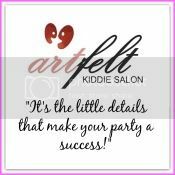 It’s totally Mom approved and now Mamanee approved! 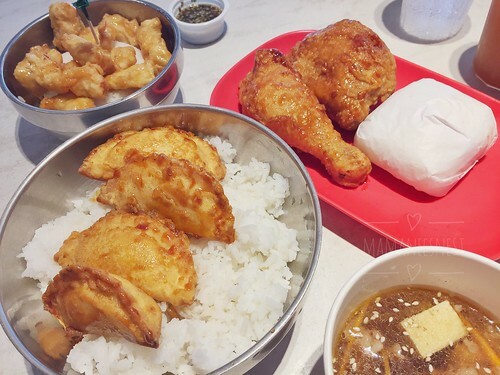 Take your little lads and lasses out for a treat this weekend to enjoy Bonchon’s Kiddie Adventure Meal –worth the price, the time and the hungry tummy! 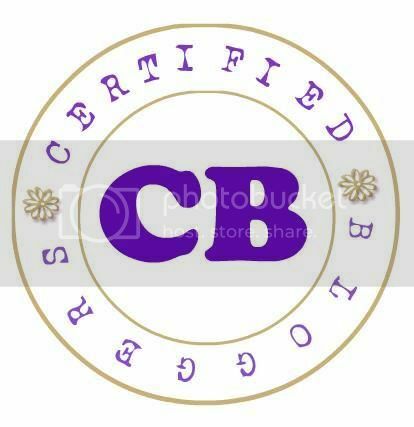 Learn more about the promo on their website here. Like Bonchon on Facebook, Instagram and Twitter to keep up with their promos.